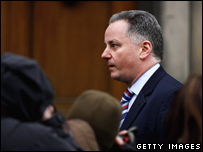 Scotland's First Minister Jack McConnell said he was "happy to help" the cash-for-honours investigation. He made the comments after it emerged he had been questioned by police from Scotland Yard in London last month. Officers quizzed him about his nomination of Colin Boyd, the then Lord Advocate, for a peerage. Mr McConnell said he was "disappointed" that what he saw as a "normal and straightforward nomination" had become caught up in the investigation. Metropolitan Police officers have been probing claims that political donations were given in exchange for peerages. The inquiry was sparked after it emerged that a number of large secret loans had been made to the Labour Party before the 2005 general election and that some of those lenders had subsequently been nominated for peerages. Police have so far spoken to about 90 people including Prime Minister Tony Blair and former Tory leader Michael Howard. All deny wrongdoing and no-one has been charged. Mr McConnell stressed he knew nothing about cash advances to the Labour Party. 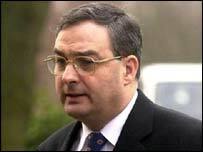 When he was lord advocate, Lord Boyd was head of the prosecution service and was also the Scottish Executive's senior legal adviser. It has now emerged that the first minister was questioned by two officers from the Metropolitan Police at the offices of the Labour Party's solicitors in London. That took place in December last year and the 15-minute interview was not carried out under caution. A source close to Mr McConnell said the First Minister was "irritated rather than angry" about being questioned. Speaking outside his Edinburgh residence on Tuesday, Mr McConnell said: "I was obviously disappointed that the perfectly normal, straightforward nomination of Scotland's lord advocate to serve in the House of Lords has been caught up in this police investigation. "I'm very happy to help the police with their inquiries." He added he was also disappointed but that being interviewed was "a distraction" from the fight between his party and the Scottish Nationalists in the run up to May's Holyrood election. He added: "I will not allow this minor distraction to divert me from winning the debate over the next few months and ensuring Scotland stays on the right path to prosperity and success." Scottish National Party MP Angus MacNeil raised the original complaint over alleged cash-for-honours to the police. He said: "The entire Labour Party is becoming engulfed in this crisis of its own making. "No-one believes for a second that Mr McConnell is directly implicated in securing cash for honours. "But as a political party, Labour has financed campaigns north and south of the border with funding from people whom Tony Blair has subsequently ennobled or knighted." Mr McConnell had nominated the then Lord Advocate in 2004, but the announcement was delayed because of the 2005 general election. As Lord Advocate, Colin Boyd was Scotland's top law officer for six years, until he stood down in October last year. It was announced he was being ennobled in April 2006 and he was formally introduced to the House of Lords as Lord Boyd of Duncansby a few months later.